Gen-Con 2018 starts on August 2nd in Indianapolis, Indiana. There are hundreds of games that are being released or demoed at the convention. We dug through the list and picked out the games that we are most excited to play (and hopefully pick up some day.) Here they are in no particular order. 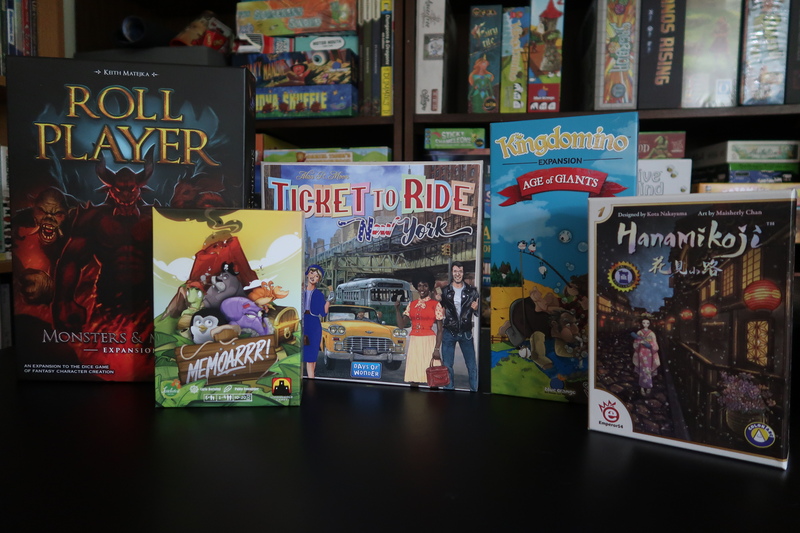 We talked about our Gen Con picks during our weekly gaming chat, which you can watch here. The games we discussed are also listed below. We've really found a love for deck-building and card-based games, as we talked about in one of our weekly chats. We saw a few similar games at this year's convention that caught our eye. One is called One Deck Galaxy by Asmadi Games. The early info on it sounds like it's a game where you use the deck to build out the galaxy for your galactic civilization. Another card-based space game is Pocket Mars by Grey Fox Games, which I remember seeing at Origins Game Fair but I didn't get a chance to try it. It looks like a fun way to try to colonize Mars. One that we also saw at Origins and we were excited to try was The Tea Dragon Society Card Game by Renegade Game Studios, but by the time we had a chance, it was sold out. It's based on a graphic novel by the same name and the art looks gorgeous. There are also a few games we saw that would be fun for the kids to play. It's always good to expand beyond the standard mainstream games for the kids. The Magical Treehouse by Alderac Entertainment Group looks fun to play with the family. You are an apprentice witch and you need to build magic treehouses for your familiars. Blue Orange Games is releasing Blue Lagoon at Gen-Con. In this game you play as settlers creating their civilization on a newly discovered archipelago. 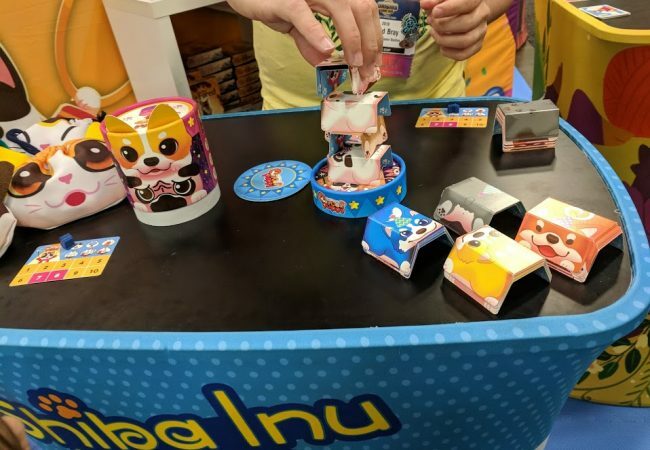 One game we did get to demo a bit at Origins was Circus Puppy by Renegade Game Studios. It's a cute game using small cardboard puppies who need to do circus performances to get points. It takes a bit of a steady hand, but it's easy for kids to play and learn. You can watch our quick demo on our YouTube channel. Another one we're interested to learn more about is Snow White and the Seven Dwarfs: A Gemstone Mining Game by USAopoly. It is a push-your-luck type game where you try to collect the most gems at the end of the round. It is said to be based on an older game called Quartz. The kids will love the Snow White theme of it. Another Disney-themed game that is coming out is The Incredibles: Save the Day by Wonder Forge. This one is a cooperative game, which we really enjoy playing as a family. It'll be even more fun to save the day as our favorite Incredibles characters. Kingdom Run by Ankama looks like a lot of fun. A dice-rolling game with some easy strategy. Can you win the race and become the ruler of the kingdom for the next century? One game we got to play at Origins and everyone loved was Pyramid of Pengqueen by Brain Games. It has a neat feature using magnetic pieces allowing one group of the players to move without letting the mummy player to see where they are, but they can see the mummy. We won a copy of MemoArrr! by Stronghold Games at the Nexus Game Fair in Milwaukee earlier this year and we all have fun playing it. It's a nice twist on the standard memory game that keeps the game interesting and fun. 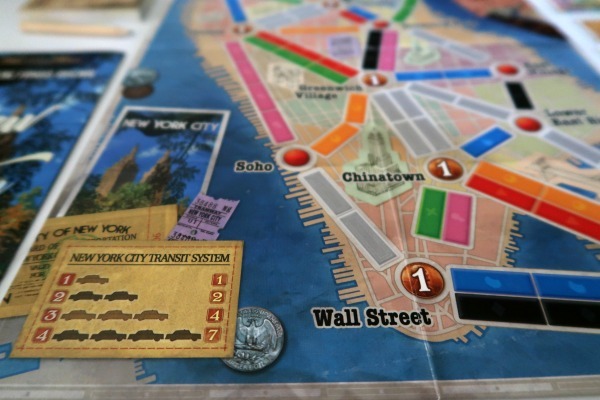 You shouldn't leave Gen-Con without picking up your copy of Ticket to Ride: New York by Days of Wonder. It's a great Ticket to Ride option that's quick and easy to learn and play. It's a good option to introduce people to the Ticket to Ride series and also play in under 20 minutes. You can read our review to see what we thought about it. We got to sit down for a quick demo of Gold Fever by Stronghold Games at Origins. It's a fun little press-your-luck game that is quick and can be played almost anywhere. One of us here loves Maleficent, or almost all Disney villains for that matter. Disney Villainous by Wonder Forge looks like the perfect game for us. We watched some people play it and we really like the concept. Time to take over the world! Throughout my life, I've had a fascination with trains and railroads. 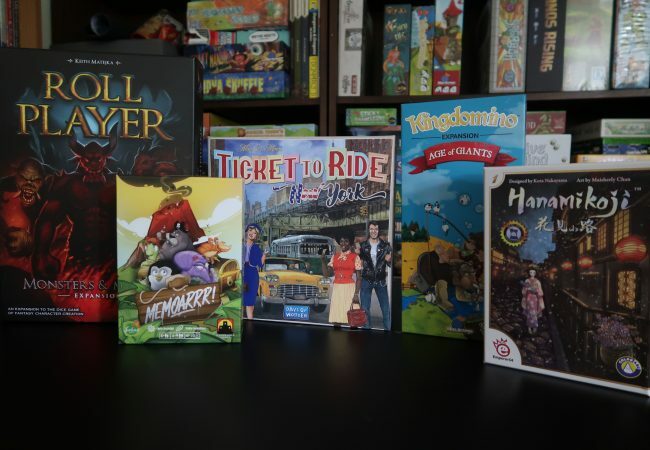 I've been able to enjoy many video games related to them over the years, but now we want to try some board games. There are a lot of the out there and we found some interesting ones in this year's list. Trainmaker by Alderac Entertainment Group was the first one we saw. It looks like a quick play dice-rolling game where you try to build your train. You can press your luck, but try not to derail it. Another one we saw at Origins, but did not get to demo, was SteamRollers by Stronghold Games. It plays a lot like a Roll-and-Write game where you draw your tracks and try to accumulate the most delivery points. Another train-based game we've seen a lot about recently is Railroad Rivals by Forbidden Games. It is described as a tile placement and drafting game. We've had a lot of fun with those style of games recently. It's hard to tell if Railways of the World is a new release this year, but Eagle-Gryphon Games is promoting it at Gen-Con. It looks to be an re-implementation of their original release from a few years ago. Either way, it looks like a deep strategy game where you build your small railroad into a vast empire. Railroad Ink by CMON Limited looks to be an interesting take of the railroad genre. You are able to use small dry erase boards to draw your routes and exits, trying to optimize the symbols better than your opponents. It also comes in two version, red and blue, which give you unique expansions. 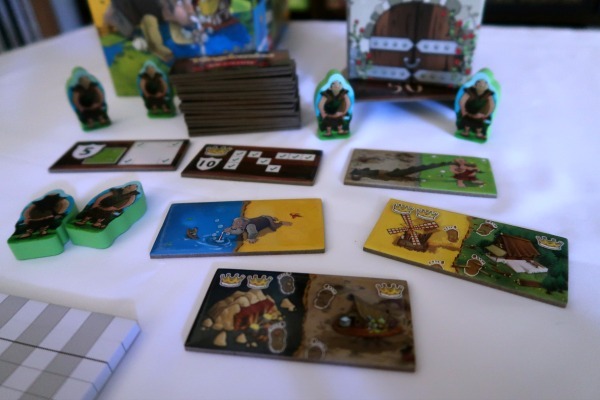 We've been playing a lot of the Age of Giants expansion for Kingdomino. Blue Orange Games is releasing it at Gen-Con. Check out our thoughts and playthrough. We recently were able to try the beautifully-designed card game, Hanamikoji by Deep Water Games. You use strategy and risk-taking to try to gain the favor of the seven Geishas. We really enjoyed it. Learn how to play in our overview video. A couple of games that we have already played a bit at home and at conventions are being shown at Gen-Con. We already loved Forbidden Island and Forbidden Desert by Gamewright and now they're releasing Forbidden Sky. We're really excited to see how this one plays out. We've played Patchwork by Lookout Games a few times and really enjoyed it. Now they're releasing a version called Patchwork Express which turns the game into a quicker version. The concept is great and the strategy is fun but easy for most people to pick up quickly. If you follow us at all on social media, you'll know our love for the Roll Player game and its expansions by Thunderworks Games. The Monsters & Minions expansion adds a lot more to the game without making it overwhelming. You get to take out your newly created character against a boss and his minions. Unless you've lived under a rock the last ten years (maybe hiding from viruses) you've heard about Pandemic. This year marks the 10th anniversary of the game and Z-Man Games is releasing an awesome 10th Anniversary Edition with a custom metal box including all new art with a vintage feel. We've been wanting to try the always highly-rated game Scythe, but have yet to have a chance. We love that they are coming out with a younger version of the game called My Little Scythe which looks amazing. 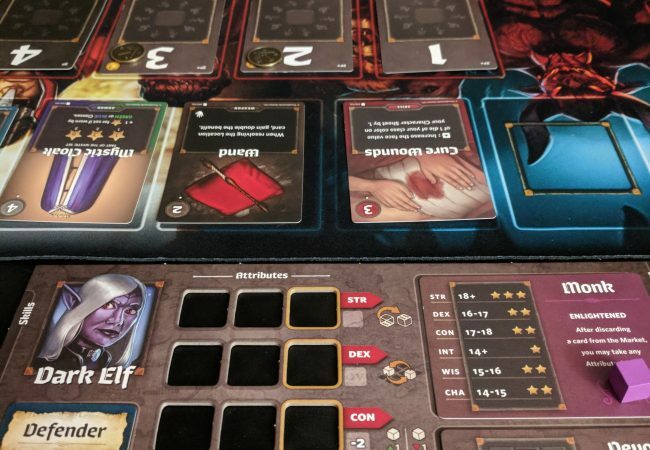 Another Deep Water Games release that is getting a ton of attention is Welcome To… We saw people playing this at Origins and now I wish I would've stayed to try it. It's already sold out for preorders at Gen-Con, so keep an eye on this one. We really enjoyed the stained glass window dice-building game Sagrada with it's beautiful dice and patterns. Next Move Games' Reef looks similar. You are tasked with building gorgeous coral reefs with your colored dice. We'd like to play Century: Eastern Wonders by Plan B Games. We really enjoy these type of strategic games. The fact that you can combine it with their other game, Century: Spice Road to make a brand new game sounds really fun. We'd love to keep going, but there are so many games coming to Gen-Con 2018. We'd be here for hours. 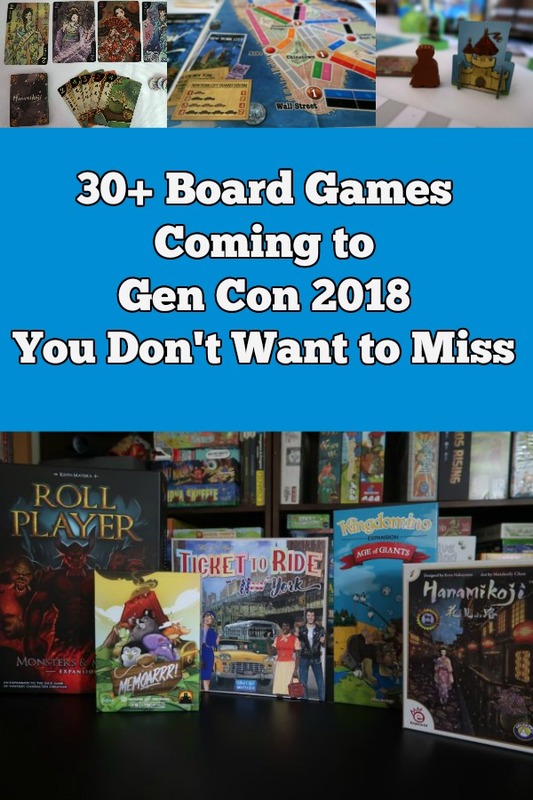 Take a look at BoardGameGeek's Gen-Con 2018 preview for an interactive list of releases and demos. Hopefully, we gave you some ideas for your next collection of games. We know we'll be picking up some new things to play. See you at the next game!